Do I have a plumbing leak? Often times we get the phone call, "My water bill tripled last month, I must have a plumbing leak". A simple test can be done by the homeowner to narrow the problem. We will use the water meter located typically near the sidewalk or street of your home to verify the problem. 1. 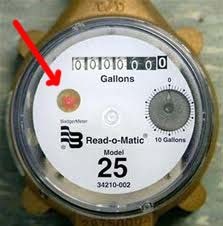 Most water meters have a small star dial, this measures small amounts of water usage by the dial spinning clockwise. 2. Turn off all water usage such as dishwasher, wash machine, sprinklers, pool filler, etc. 3. Check the water meter and see if the red dial is spinning, if so, we are losing water. A. Turn off lawn sprinkler backflow, to shut off entire sprinkler system. CHECK THE METER - if the dial has stopped, your problem lies in the sprinkler system. B. If its still spinning, shut off your pool filler. Cold or Hot water leak. CHECK THE METER - if its still spinning we most likely have a cold water leak. If not, its most likely a hot water leak.